Receiving high quality backlinks from .gov sites can dramatically increase your website rankings, but actually getting those powerful backlinks is a monumental task. Although there remains some debate over the true value of .gov extensions with Matt Cutts stating, “Google doesn’t treat .gov or .edu domains any differently,” most SEO professionals feel otherwise. 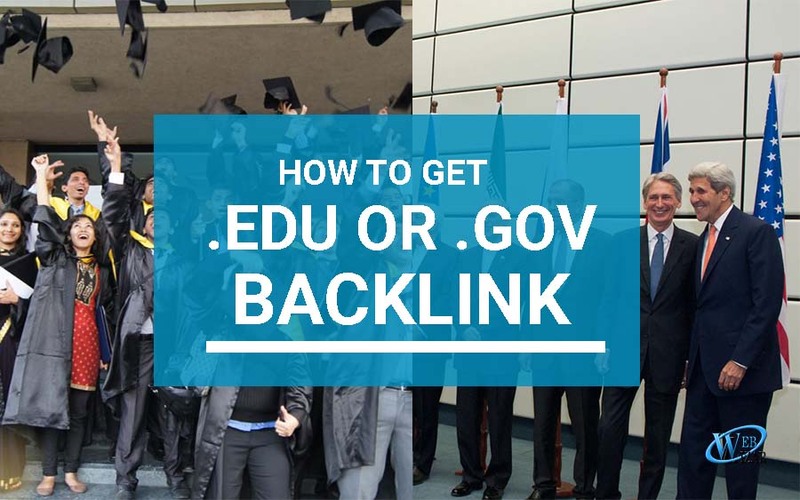 Lets us see some ways to make .edu and .gov backlinks for your website. Google may not view them any better than .com. .net, or .org, but the authority factor .gov links hold gives them extra SEO power. While Google won’t give a definitive answer regarding the power of .gov links, they are considered to be the holy grail of backlinks because they are established and trusted sites. Many believe .gov extensions have certain superpowers, which is true to an extent. Your site can still rank well without receiving any .gov backlinks, but if you’re one of the lucky who does score a backlink from the high authority sites, your own website’s authority will be promoted. Government website extensions are hard to get because most belong to government organizations, so they won’t just link to anyone. Getting backlinks from a .gov site is a time consuming task. You actually have to work to earn those links, more so than earning the links of other top domains. The first step is to ensure you have all of your ducks in a row. Your website must have an existing foundation of informative and relevant content, mixed with on-site optimization to appeal to .gov sites. With an existing backlink profile already containing high level links, you’ll climb the rankings and be more appealing to .gov sites. You must have a quality website that’s not only worthy of backlinks from .com extensions, but .gov, too. If you can’t even get .coms to link to you, you’re not ready for .gov. And, it doesn’t hurt to establish yourself as an industry influencer first. As an industry influencer, you can then leverage that influence to attract government website extensions. There are more .gov extensions than there are government agencies. So, not all .gov sites are actual government organizations, so do your homework to ensure they are legit. Use advanced search modifiers like “site:.gov” to help you narrow your focus to find real agencies and relevant agencies to target. One of the most common ways to try to earn a .gov backlink is to comment on government blogs and websites. It’s a proven means to getting backlinks, but it’s not as easy when compared to commenting for .com backlinks. Most government sites don’t allow for commenting, and if they do, chances are they are “no follow.” If you’re lucky enough to find a government blog that isn’t “no follow” the comments are under a lot of scrutiny. If your comment doesn’t provide the right quality they are looking for, it will be deleted. Although chances may be slim of receiving a backlink with blog commenting, it’s worth a shot. Just make your comment is valuable and don’t spam. To increase your chances of having a Do Follow comment published, use “site:.gov inurl:blog “post a comment” -”comments closed” – “you must be logged in” “niche you’re searching” to find .gov sites that allow do follow comments. Outside of just trying to get comment links, you can also use the commenting and contact features to promote content to the website, but you need to have great content. Draw attention to your website by writing a high quality article about a government agency, then market the article and notify the agency that you’ve written about them. For example, if you own a renewable energy company or build energy efficient homes, create a related article and discuss the Office of Energy Efficiency & Renewable Energy. If you’re targeting a global audience, use this method for foreign government agencies, too. The same method as writing about a government agency can be applied to writing about a politician. For example, if there is a new law proposed by a politician that will impact your business, create an article and link to the proposing politician. Then, notify the politician about your publication. Interview an established member of a local government agency regarding a topic that’s relevant to your company or website. In most cases, if you have the right topic, they will agree to the interview. At which point, you can then publish on your website with a link pointing to the government agency. The interviewee, and in some cases, the agency itself will share the interview, earning you a backlink. Try to land a government contract. Although this isn’t always possible depending on the niche of your company, in some cases, you can manage to get a government contract. Then, develop a press release announcing the contract and publish a backlink to the agency. Also, if you can create a partnership with a government agency they will often link to you from their website. In some cases, you can develop a resource page on your website depending on your niche. If you have a local business, create a resource page linking to local government agencies to provide information about local amenities, accommodations or other applicable information that local website visitors will find valuable. Even for those who aren’t local, you can build resource pages for government regulations or laws pertaining to a product you sell. For example, if you’re an exterminator or use pesticides, link to the Environmental Protection Agency’s pesticide regulations on your resource page. If you can add valuable insight on a program, you can earn a link. Many government websites, such as county websites, have resources pages for local businesses. Request to be added to the local business or local resource page, which will provide you with the valuable backlink and added credibility in the community. Attend, donate, or work with related government outreach programs in the community. Attend upcoming events and seminars to network within the agencies. Use these as opportunities to establish yourself to increase the odds of earning a backlink. For example, if your company donates money to a charitable organization, they often get listed on the website with a link. Flattery almost always earns links. Find out what a government agencies pain points are and write a post telling them what they want to hear (only if you actually feel that way of course). Then, promote that piece to as many people at the agency as possible. There’s always the tired but true method of guest posting to earn backlinks, but this is more challenging to accomplish on .gov sites than .com. Government websites and blogs are extremely picky when it comes to who they allow to guest post and what topics are suitable. But, if you’re able to create an amazing post that actually gets posted on a .gov extension, you’ve gotten yourself a backlink. If your link profile suddenly gets a ton of new .gov links, this should alert you to potential spam. Getting too many .gov backlinks too soon could throw up a red flag. Backlinks from .gov extensions are a powerful tool for your website because they are high authority sites in the eyes of Google. However, you won’t receive a backlink as easily as with .com extensions. You have to put in the elbow grease to get these ones. Do you have any additional tips for getting .gov backlinks? Let us know in comments section below.